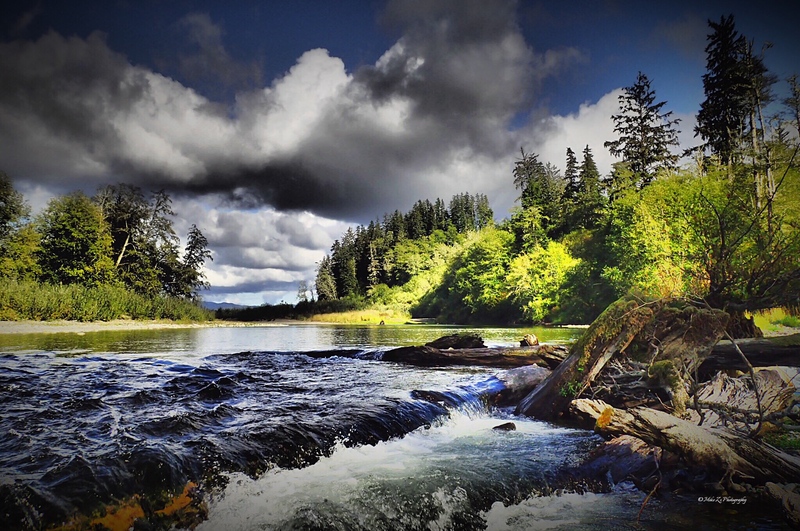 The rivers of the western side of Washington’s Olympic Peninsula are amongst some of the most beautiful in the world. Although in certain stretches of each river you might mistake one for another, each of the area’s streams that we fish has a unique character from the raging rapids of the upper Sol Duc, Calawah) to the broad glacial valley of the Hoh River or the gentle meandering of the middle and lower Bogachiel. Perhaps the best known of the area’s rivers, the Sol Duc (Quileute for “sparkling water’) begins in the Seven Lakes Basin in Olympic National Park and surges downstream amid it’s countless boulder fields to its confluence with the Bogachiel River ( the combined rivers become known as the Quillayute ). We probably spend more fishing days on this river than any other over the course of the year due in part to the river’s ability to stay in good fishing shape even after a fairly heavy rain. The river, especially the uppermost drifts, have relatively steep gradients and provide anglers with a fun ride down the river even on the days when the fishing isn’t the best. The Bogachiel is, for most of it’s fishable length, the “bunny hill” of the region’s rivers. Beginning on the southwestern flank of Bogachiel Peak in Olympic National Park’s High Divide, the river lays mostly within the park boundary. The river is best known amongst anglers for it’s large run of hatchery origin steelhead yet some of the largest steelhead to return to any Peninsula stream return to the upper reaches of this river. The upper reaches of the rivers boatable water is characterized by small “rock gardens” nestled between some of the finest fly fishing water on the Peninsula. As you near the river’s confluence with the Sol Duc, the river’s gradient becomes flatter and often forms long slow pools that leave driftboaters wishing they had outboards. Calawah means “middle river” in Quileute, referring to the river’s placement in between the Sol Duc and Bogachiel Rivers located just a few miles distant. The main river begins just four or five miles east of Forks where it’s two forks (the North and South, of course!) join and it dumps into the Bogachiel about three miles west of town just below the steelhead hatchery on the Bogachiel. The river receives light fishing pressure to due to it’s relatively poor bank access and the nearly constant class II and III rapids that make navigating the river dangerous for oarsmen not familiar with the rivers many splits and drops. The Hoh (thought to mean “fast white water” or “snow water”) is Mother Nature’s version of Dr. Jeckyl / Mr. Hyde. Often changing its course by hundreds of yards after a heavy rain, the shifts in the riverbed are only part of this river’s multi-faceted character. From the National Park boundary (the uppermost launch) downstream, most of the river meanders through ancient glacial deposits and often enormous log jams through most of it’s length. Then, just ten miles from the ocean, the river abruptly drops into a a small canyon cut out of bedrock. Through the “canyon”, layered rock deposits point upward nearly vertically showing evidence of the strong tectonic forces that created the Olympic Peninsula millions of years ago. These rock walls rise abruptly, covered with moss and some towering spruce, fir, and hemlock that were already here for centuries before the arrival of the white settlers. Small waterfalls running off the canyon walls into the river are about the only noise you’ll hear other than the occasional call of a bald eagle or the drumming of a male grouse. The “canyon” stretch lasts about two miles, then, just as suddenly as we drop into it, we re-emerge into the broad valleys of the lower river.